This past semester I have begun interning for RJ Dunlap Marine Conservation Program. It is a spectacular program that blends research and outreach by bringing citizens, particularly high school students on shark tagging expeditions where they get to assist in the collection of data for current shark research. What follows is my account of a recent scouting expedition to find new shark tagging locations. See the original post on RJ Dunlap’s website here. I stared at buoy three as it floated further and further away. In my mind there was only one explanation; one of us had mistied a bowline, allowing the buoy to free itself from the weighted drum on the ocean floor eighty feet below. The drum was lost to us and with it the line and baited hook. If a shark got hooked now, there would be no way to free it. 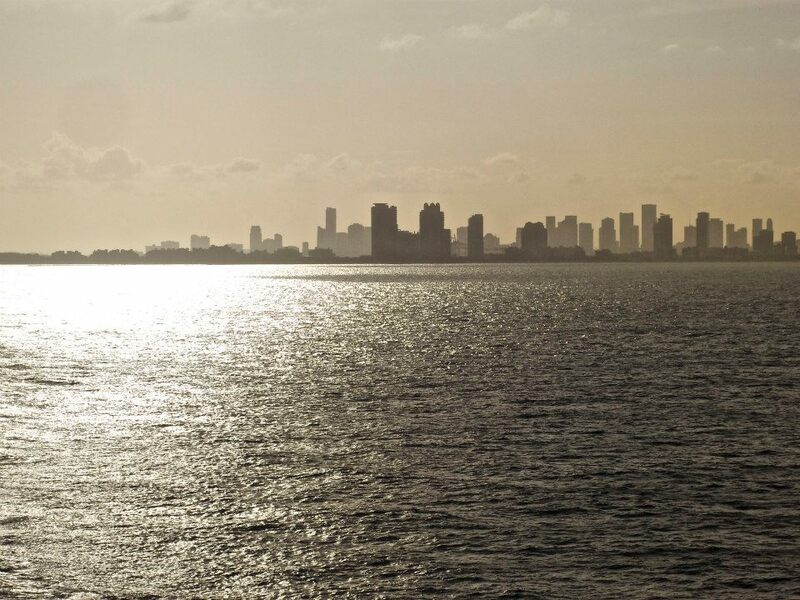 A view of the Miami skyline. Photo credit Rick Thompson. We were an hour into a scouting trip to a deep reef right off of the coast of Miami. We had just finished deploying our first set of ten lines when the captain noticed the wayward buoy. With the Miami skyline in the distance and a glassy, flat ocean all around, it had been shaping up to be a beautiful day, but as the boat turned to go collect the buoy I stressed over such a bad start. As we got closer to the buoy however, it became very apparent that the buoy was moving in the opposite direction of the current and was still firmly attached to the drum below. Something big had to be pulling all that weight. In a flurry of movement we prepared to bring the shark in. As one of the interns slowly reeled in the line, a large sickle-shaped dorsal fin broke the surface. We had caught a hammerhead. Me taking a blood sample from a nurse shark. Photo credit Frank Gibson. We brought the great hammerhead along the back of the boat and quickly got to work. Hammerheads are particularly susceptible to stress, so instead of completing a full workup we took only cursory measurements and a small fin clip. Then it was time to tag him. Earlier that morning our lab manager Christian had prepared a satellite tag just in case we had a catch like this. In less than a minute, the specially designed hammertag was in place, bobbing along just behind the shark’s dorsal fin as he made his way through the water. 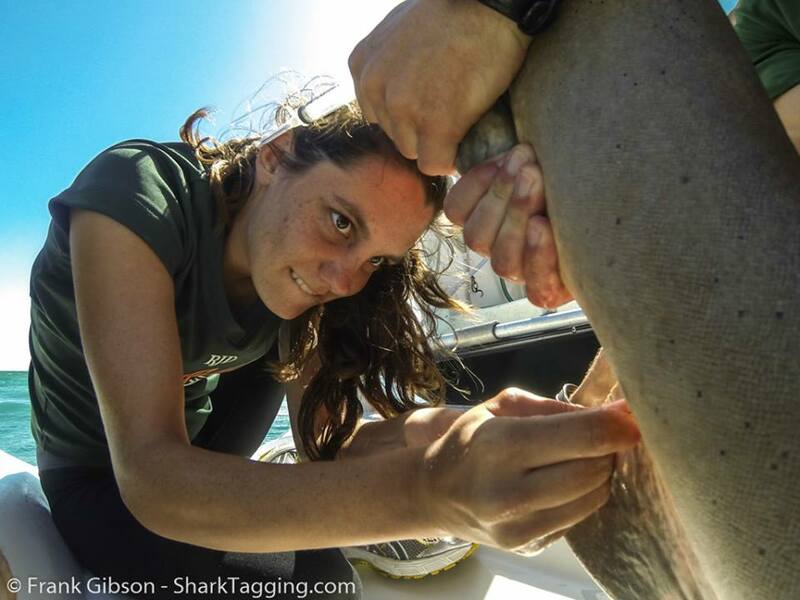 With that tag, every time the shark surfaces, we will receive data about his past movements, current location and a variety environmental factors. As everyone strained to catch a final glimpse of the shark, the mood on the boat was decidedly giddy. We hadn’t officially begun hauling in our first set of lines, and already we had caught a hammerhead. As we began to bring in the first set of lines, all of the RJD crew, staff and interns alike, could not stop grinning. The first few lines came up empty, then we realized buoy four was missing. We had another runaway. We scoured the ocean around us seeing nothing until finally, the captain made out the tiny red dot of the buoy halfway to the horizon. It could only be another hammerhead. Out of hammertags, we quickly pulled him in, took our measurements and fin clip and sent him on his way, a standard spaghetti identification tag firmly in place at the base of his dorsal fin. The rest of the first set of lines was relatively uneventful, with the exception of a feisty green moray that had decided to latch on to one of our baited hooks. The moray put up a pretty impressive fight, tying itself in endless knots, until finally, after getting the hook free, he slithered off the boat and back into the water. With the second set of lines we caught our third hammerhead of the day, allowing us to reach what we had thought was an ambitious morning prediction of three hammerheads. We also hauled up a massive nurse shark and a line that had been chewed all the way through by what was most likely a bull shark. 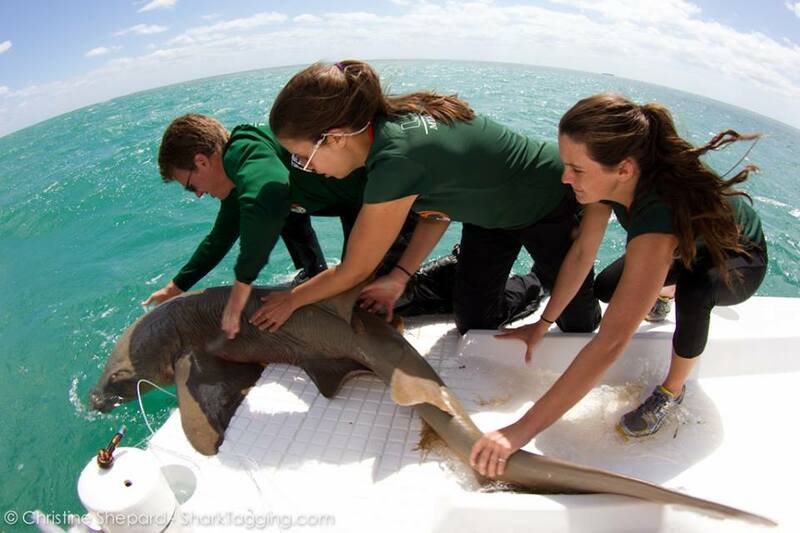 The release of the nurse shark. Photo credit Christine Shepard. For the final set of lines, it was decided we should scout out another, shallower location. I was thankful, hauling in over 100 feet of line is not an easy job, and everyone’s arms were starting to feel the toll. The set sped by without a bite until line nine. Reeling in the line, I thought we were just bringing in untouched bait, until I noticed a tiny nurse shark attached to the end. With a total length of just 95 cm, or just over three feet, it was the smallest nurse shark I had ever seen. Everyone gathered around, cooing at it with smiles almost as big as the ones for the first hammerhead. It was our last catch, and a great way to end the day. Check out a video of our satellite tagged great hammerhead here.